Spiky-Haired Dragon, Worthless Knight :: View topic - Actual comics: "Dead tree editions"
Actual comics: "Dead tree editions"
Posted: Thu Jun 28, 2007 1:30 am Post subject: Actual comics: "Dead tree editions"
I'm curious. Is there any chance of SHD-WK ever becoming a conventional comic book? I don't know how it is in Finland, but in America (where I am), a number of webcomics exist as both free comics on the 'Net and as actual printed comics available in stores. 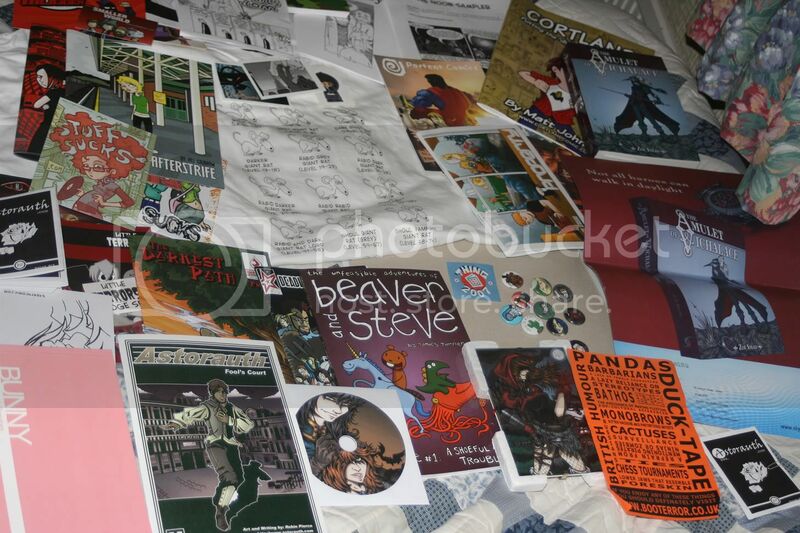 PVP, Penny Arcade, and Nodwick are three prime examples; Image Comics prints PVP, Dork Storm Press does Nodwick, and ... I forget who's responsible for Penny Arcade. I have to say, if there were a "hardcopy" version of this comic in stores, I'd probably buy it. Well, assuming I could find it. Posted: Thu Jun 28, 2007 3:17 am Post subject: Re: Actual comics: "Dead tree editions"
Is there any chance of SHD-WK ever becoming a conventional comic book? I definitely would buy it in print. It wouldn't change the story or anything (I sure hope there won't be director's cut with an ultra cutesy extra character), but it would be really neat to be able to actually hold it in hand. With a lot of the American webcomics -- I'll use PVP as an example, since it's one I actually collect -- the hardcopy editions are just the original webcomics, bound together. Sometimes, sometimes (maybe once or twice a year), there'll be a special bonus insert, usually a side-story. At the most, they might include ... "scenes and language" that were removed from the 'Web version. And the writer/artist, Scott Kurtz, always converts the covers to wallpaper and posts them on his website 2-3 months before the issues hit the stores, so I guess you could call that an extra. I'm no expert on the technical matters, I admit, but ... SHD-WK is essentially a 4-koma strip anyway (the same format used in many Japanese strips like Azumanga Daioh), so they probably wouldn't need reformatting. Again, PVP was originally drawn as 2x2 squares, and I believe it kept that format when it was printed. Now, it's done as normal 4 horizontal panels; and when printed, it keeps those 4 horizontal panels (though the comics are printed sideways, which is ... not bad, but strange). As for re-drawing the earlier strips ... every, every person with any artistic inclination feels the same way about their early stuff (I cringe in pain when I read my early stories), but ... half the fun (for me, at least) is being able to flip back and see how characters and styles have changed over the years. I'm no expert on the technical matters, I admit, but ... SHD-WK is essentially a 4-koma strip anyway (the same format used in many Japanese strips like Azumanga Daioh), so they probably wouldn't need reformatting. I might buy it...it'd probably depend on the price and how many strips were actually in the book (or even possible extras that you can't see online)...I have bought books for webcomics before, though...and been to the webcomic convention held in London the last couple of years (it's called The Thing - last March's haul). Probably not, seeing as my ability to buy stuff on the net is pretty limited (Europe only). Then again, with a bank account and IBAN stuff, I probably would (if not too expensive, there are shipping costs after all). In stores? Yeah! But that won't happen. probably not, and not because I don't enjoy it- I do enjoy it, but I don't have money to spend on fun, but not really necessary things. Plushy Spiky would be another thing- this would be really cool to have. Amen on that. Okay, Ak-ryuu, any chance of a Spiky plushie? Ak-ryuu, any chance of a Spiky plushie? I probably already posted about this elsewhere, either here on the forum or in that news/blog thingie .... but yeah, Spiky plushies are my #1 wanted merchandise. It's something I really want to do, and I have researched it a bit already too; I just will need to have a lot of money upfront to get them done ... But it might be possible. I just will need to have a lot of money upfront to get them done ... But it might be possible. Forget it. Even laying aside the dexterity and time required, the price alone would be outrageous. My wife collects Cabbage Patch Kids. The normal, store-bought, off-the-assembly-line models are around twenty dollars. The hand-made versions available at the "CPK Museum" sell for around one hundred fifty dollars. And this price difference is actually normal. I'd like a Spiky plushie, yes ... but I couldn't see paying more than $25 for it, maximum (not including shipping & handling, of course). And while a hand-made plushie would definitely be interesting as a collector's item, I doubt very much that it'd be worthwhile to either the maker or the buyer. Besides, I'm sure ak-ryuu has more interesting things to do than to sit around sewing plushies. He does have a life, after all. Location: my mind....i have no clue. ask him. i would want a plushies of everyone. if you can't see what happend you can't blame me. your fired.